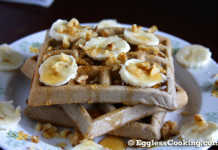 The vegan waffles recipe has been such a hit that my son wants it every weekend. Yes, as mentioned earlier in the spinach smoothie post, pancakes, bread and its like are reserved to weekends at our house. So my son was ecstatic when I surprised him with these vegan chocolate waffles on a Sunday morning. This recipe too is from Vegan Brunch. I did make one change though. The original recipe was for a chocolate beer waffle. So I replaced the beer with the same quantity of almond milk. In the mood for a slice of chocolate cake? 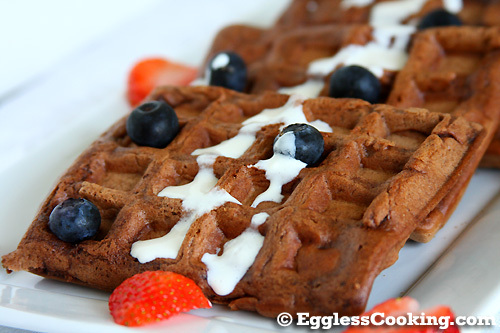 Then this vegan chocolate waffles can help you a wee bit to satify your cravings. Preheat the waffle iron according to the instructions which came with yours. Make a well in the center and add the wet ingredients one by one. Mix together until well combined. Spray the waffle iron with cooking spray and prepare waffles as instructed in your waffle iron manual. Serve it with your choice of topping. These vegan chocolate waffles tasted like a “low-fat, low-sugar chocolate cake” for me. I think I would increase the quantity of vanilla extract by another teaspoon when I prepare it again. 3/4th cup of porter/darker beer was suggested in the original recipe, which I have replaced with almond milk. 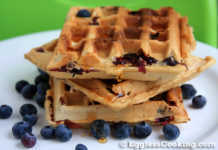 The next time I make these waffles I want to try substituting it with freshly squeezed orange juice. 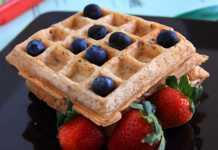 The white topping on the waffles is sweet cashew cream which is sort of a substitute for whipping cream. This recipe too is from the same book. I’m not writing the recipe here because I’m not completely satisfied with the result. The taste was definitely good but it did not firm up as much as it was mentioned in the book. So I’m going to try it again and will have to decide then whether to post the recipe or not. Ur recipe is eally wonderful..my 6yr old girl loved a lot…tried with strawberry too…..amazing taste. Thank u so much for such a wonderful recipe. I added two bananas and some honey and it came out perfect! my toddlers loved them. they were not too plain and not too sweet just right! I tried this waffle recipe tonight with a ball of this (http://veganyear.blogspot.com/2011/05/double-chocolate-waffles-with-mint.html) vegan mint ice cream (minus the chocolate chip) on top and it was A-MA-ZING!!! What a treat! Thank you so much for sharing! Almond milk is made by soaking almonds, blending it with water and filtering to remove the pulp. This is used as a substiute for dairy milk by vegans and people who are lactose intolerant. Do you, or have you ever made your own almond milk? I make it all the time Jane. I have been thinking of posting the recipe too but didn’t get a chance yet. Wonderful recipe, I am new to Cakes, Cookies and Waffles. But I love them a lot.